I am pleased to announce that I have another short story being published, this time as part of Malice Domestic’s annual anthology. 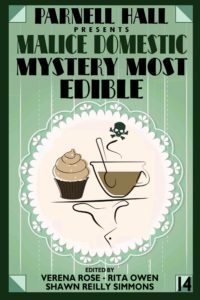 This year’s volume is entitled “Mystery Most Edible,” and features food-themed stories. Violet is on another adventure in “Mrs. Beeton’s Sausage Stuffing.” Violet Harper fans know exactly what she thinks of the revered Mrs. Beeton, so what could the famed domestic authority have to do with Violet solving a murder? All will be clear inside the pages of the story! The 2019 Malice Domestic anthology is available for preorder and pickup at the 2019 Malice Domestic mystery convention in Rockville, Maryland! (That’s why there is no shipping charge. You MUST pick up preorders at the convention.) Find copies at your usual bookseller location after May 2019.